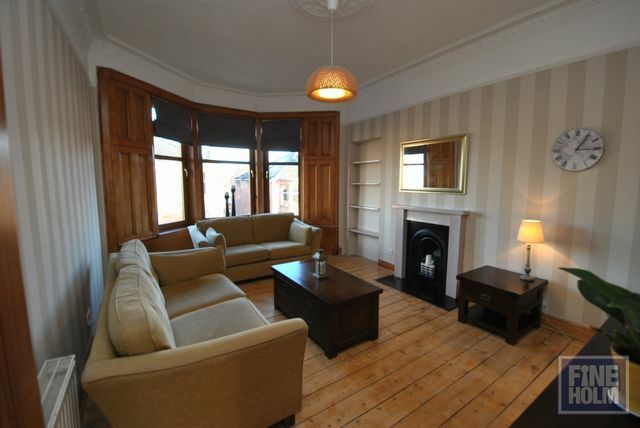 New to the rental market this top floor flat is perfect for a professional couple or single person keen to appreciate all that Glasgow's thriving West end has to offer. Its location close to Kelvinbridge with its many cafe's , bars and boutiques make it a super place to call home. Underground is close by at Kelvinbridge or many bus routes on Maryhill Rd. The flat has been tastefully decorated throughout , is furnished and has a comfortable and homely feel. Entrance hallway with large storage cupboard, bathroom to rear with shower over bath, rear facing bedroom with large wardrobe, spacious internal kitchen with fridge/ freezer, washing machine, oven and hob (and obligatory pulley!) and bright bay windowed living room with feature fireplace ( decorative only). The living room and hallway have original wooden floorboards and high ceilings throughout. GCH. Double glazing throughout. Secure entry. Street parking.